Thanks for visiting the Condenser Needle support section. Here you will find answers to the most common support questions our customers have. Utilize the tabs to find the appropriate selection for your needs. How much coil cleaner does Condenser Needle use? 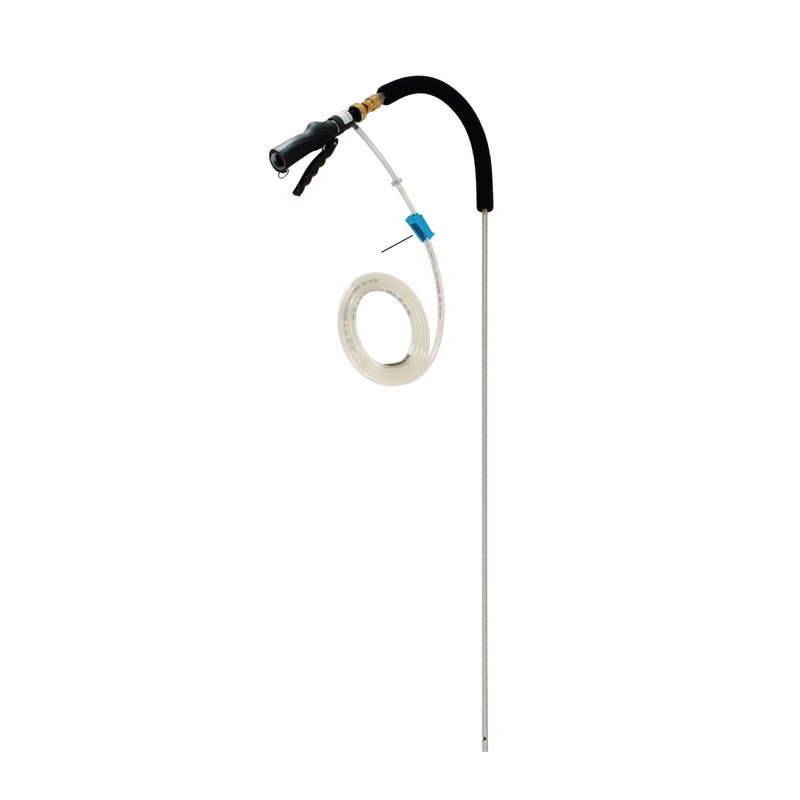 You can apply as much or as little coil cleaner as you would like with the Condenser Needle. It includes a chemical siphon that can be adjusted in ratio from a straight water flush to a 16:1 ratio. No water when spray gun trigger is squeezed. Water is not turned on.Turn water on. Hoses and/or nozzle clogged.Check hoses and nozzles for clogs. Low water pressure or flow. Restricted valves, nozzle or hoses.Open all valves completely; check hoses and nozzles for debris. Low input flow or pressure.Check for other valves that are not completely open. Siphon hose control valve closed.Roll control valve wheel. Siphon hose strainer clogged.Clear any clogs. Hose kinked.Check hose for pinch bends. Water flow too low.Make sure all valves are completely open. Worn seals.Replace seals (Contact Factory). Debris caught in seal.Clear debris. Every Condenser Needle comes with a 1 year parts and labor warranty. This unit has been carefully tested and inspected at the factory and is warranted to be free from defects in material or workmanship. The company will, under this warranty, repair or replace any parts which prove, upon examination, to be defective. This warranty is F.O.B. factory and is valid for one year from date of purchase by original purchase. This warranty does not include unusual wear, abuse, damage resulting from accident, or unreasonable use of the portable coil cleaner, including using unapproved chemicals or detergents. Any repair made by others automatically voids this warranty. For repairs or warranty information DO NOT contact the place of purchase.